Bleu’s pool runs the length of the house, and sits right on the beach. 6 bedrooms leaves room for every family member or friend, and the ample seating and dining are sure to please. To top it off, Bleu is within a minute’s walk to several great restaurants and the island’s newest spa! Bleu Villa, is a modern 6-bedroom villa located in the Grand Cul de Sac within steps of the beach and a short walk from restaurants. This villa is also uniquely situated next to the new Barthelémy hotel, which features a restaurant, fitness room, spa and beach club. Fully air-conditioned, Bleu Villa can close its doors or open to enjoy ocean breezes. The oversized living room offers plenty of comfortable seating, as well as an entertainment center. The living room opens to a dining area and a large, well-equipped gourmet kitchen suitable for large parties. A connecting preparation kitchen features a large refrigerator and wine cooler. All the bedrooms and the living room have Apple and U.S. satellite TV and Sonos sound systems. Two separate staircases on either side of the villa lead to the 2 master suites on the upper floor. Each master suite has a king-size bed, a dressing area, private balcony, and an ensuite bathroom with a rain shower and bathtub. The 4 spacious guest rooms are located on the main floor. Each bedroom has a queen size bed and ensuite bathroom with a shower. Two bedrooms have ocean views, while the other 2 bedrooms are on the garden side of the house. Bleu Villa can be rented with its sister villa, Aqua Villa for a total of 12 bedrooms (ideal for large families or groups). 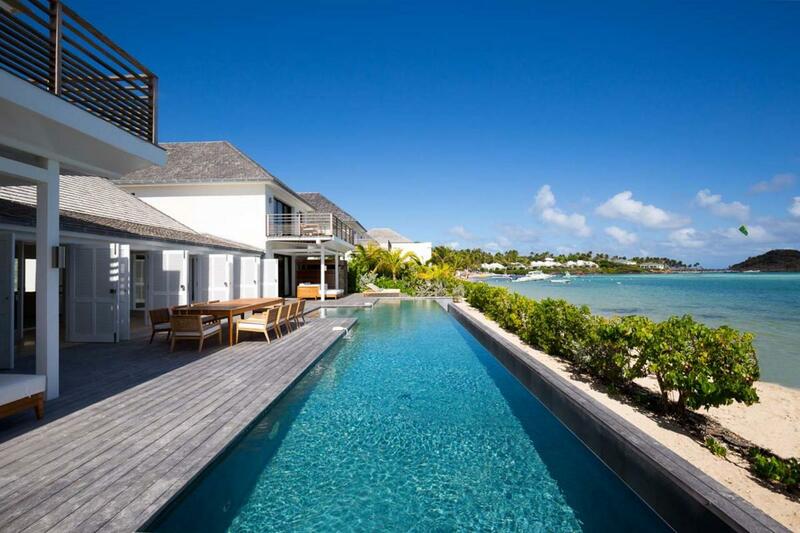 Guests can dine outside at a large table in front of the large, lap pool, which separates the house from the beach. Plenty of loungers in the sun and day beds in the shade are spread out on the wide deck. This villa also comes with daily continental breakfast.